At 12 noon Eastern Time today, November 14, 2011, the United States Mint began selling bags and rolls containing the 2011 Chickasaw National Recreation Area Quarter. These products include coins that have been produced for general circulation, but have not circulated. The Chickasaw quarter honors the national site in the state of Oklahoma, and is the fifth release this year and the tenth in the America the Beautiful Quarters® Program that began in 2010. In all, 56 national park/site quarters will be produced through 2021. Chickasaw National Recreation Area Quarter rolls come in a set of two and are priced at $39.95, which is the same as earlier releases this year. Each two-roll set contains 80 coins. One roll of 40 quarters is from the United States Mint facility in Philadelphia and the other roll of 40 is produced in the United States Mint facility in Denver. These are the same two production sites that are responsible for striking the nation’s circulating coins. Chickasaw National Recreation Area Quarter bags are $49.95, which is also the same price as previous 100-coin quarter bags out this year. Buyers have the choice of purchasing bags with 100 coins from either Philadelphia or Denver. The bags are made of canvas with tags that give the name of the national site as well as "OK" for the state and "P" or "D" for the minting facility. Today also marked when Chickasaw quarters were released into public circulation via Federal Reserve Banks and local banks around the nation who order them. Not all banks will have the coins, which can be frustrating at times for collectors, as banks can not order quarters by a specific design. Distribution can sometimes take months before the new strikes show up in pocket change. The United States Mint and the National Park Service will ceremoniously release the quarter on Wednesday, November 16, at 11:00 a.m. CT at the Vendome Well located inside the Chickasaw National Recreational Area near Sulfur, Oklahoma. There are no entrance fees for the national recreational area and the ceremony is free and open to the public. Children 18 years and younger who attend the event will receive one free new quarter while adults may exchange cash for $10 rolls of the coins. Also on the Mint’s agenda is a public coin forum that is scheduled for Tuesday, November 15, at 7 p.m. (CT) at the Travertine Nature Center Auditorium. The auditorium is located on the Travertine Creek near the eastern edge of the Platt Historic District of the Chickasaw National Recreational Area. Everyone is invited to attend the free coin forum, as it provides an opportunity for the public to ask United States Mint officials about past and upcoming coins. The reverse design, by Donna Weaver, features the Lincoln Bridge that was built and dedicated in 1909 to celebrate the centennial of Abraham Lincoln’s birth. Inscriptions on the reverse include CHICKASAW, OKLAHOMA, 2011 and E PLURIBUS UNUM. Each quarter has a common obverse which is the 1932 portrait of George Washington by John Flanagan. The United States Mint restored the image for this coin series to enhance the details and beauty of the original model. Inscriptions on the obverse are UNITED STATES OF AMERICA, LIBERTY, IN GOD WE TRUST and QUARTER DOLLAR. Two more products with the same designs as the new quarters are the three inch, five ounce .999 fine silver coins. 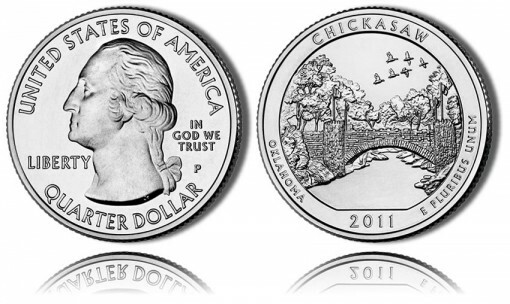 First, the Chickasaw 5oz Silver Bullion Coin was released July 18, 2011. Already, 23,800 have been purchased as of Monday, November 7. As for the second version, the collector Chickasaw 5 oz Silver Uncirculated Coin, its launch date is yet to be officially announced. 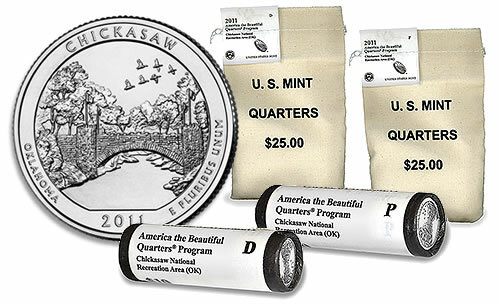 Chickasaw bags and rolls and related products may be purchased from the United States Mint website at http://www.usmint.gov/ or by calling the bureau’s toll free number 1-800-USA-MINT (872-6468). Earlier 2011 America the Beautiful Quarters included designs that honored Gettysburg National Military Park in Pennsylvania, Glacier National Park in Montana, Olympic National Park in Washington, and Vicksburg National Military Park in Mississippi. Upcoming 2012 America the Beautiful Quarters will celebrate El Yunque National Forest in Puerto Rico, Chaco Culture National Historical Park in New Mexico, Acadia National Park in Maine, Volcanoes National Park in Hawaii and Denali National Park in Alaska. For more information about the Chickasaw National Recreational Area, visit the National Park Service site for it at http://www.nps.gov/chic/index.htm.